I also read somewhere that the rear face of the prop should be brown not black so I bought Mr. Color 131 Propeller Color. Location:Where I belong: East Texas. What a minefield you have stepped in! FWIW, I'm building the 21st C Zero, and I'll do an enamel grey from the model master line(IJN grey) and i'm going to prolly try to spray a very light mix of a carmel brown over the top of it, to simulate the lacquer coating for carrier aircraft. Go to J-aircraft.com, do some reading if you want, and then build your kit the way you want, and let the armchair experts debate, while you start another project. Go with your first instincts mate. The Tamiya colours are perfectly fine for a quick, OOB build. Japanese WW2 colours are a bigger minefield than Luftwaffe ones, and will do your head in faster than a meat cleaver. About the only advice I can offer is that straight white is generally agreed to be wrong, and currently interpreted as the result of the original colour becoming sun-bleached. Nick Millman has done a lot of research in this area, and his website is worth a look. These are the paints from J-Aircraft: http://www.j-aircraft.com/misc/PAINT.HTM But as Mike and Kevin have said go with what feels and looks right for you. In order to answer your question, I need to know one thing. How accurate do you want your colors to be? I can help and can refer you to the proper references (which are not in any book...yet; i.e. Greg Springer, Ryan Toews, Jim Landsdale all from j-aircraft.com). Be forewarned that if you want an accurate color representation, you'll need to tell me what brand of paint you're using and know that save one brand, there is no out-of-the-bottle correct color for these early A6M2's. 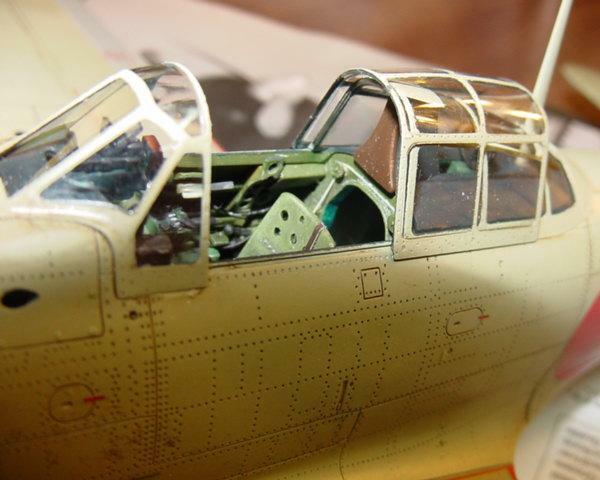 I am assuming by your post that you're using Tamiya paints which is fine and is what I use on the Tamiya early A6M. White Ensign Models makes a very good shade for the overall grey A6M2's but it is enamel. And to add another twist, you'll also need to tell me who made the aircraft you're modeling, Nakajima or Mitsubishi....both built A6M2's. Having said that, the vast majority of the A6M2's particpating in the Pearl Harbor raid were Mitsubishi built aircraft. Oh, did you know that the fabric covered control surfaces are NOT the same shade of grey as the rest of the aircraft? Now to quote Sean Connery from the movie The Untouchables, "What are you prepared to do!?" TimC has it right by referring you to Greg Springer and others. I've seen his (Greg's) collection of Japanese paint samples whih were in turn, collected from the genuine articles, i.e., Japnese planes of the era. Interior and exterior samples included. Not faded, faded, interior worn, interior pristine, exterior pristine, Greg pretty much has it all as well as color formulas to get you close if you choose to mix your colors. His research is extensive and dead on. For the generalist builder, you can't do better other than go to the Smithsonian. I'd go with the butternut grey gloss (kind of yellowish beige grey) for the early A6M. Thanks to everyone who took the time to respond. I don't normally build WWII aircraft, I prefer things that go supersonic, so I will probably only build one Zero. To answer Tim C's question, I want it to be as accurate as possible. Can I order the White Ensign paints online? I plan on building option A from the Tamiya kit. AI-102, Lt Saburo Shinden, Air superiority command, 2nd strike unit (straight from the Tamiya directions). 35 IJN Gray (Mitsubishi)- Looks to me like a straight gray, no tint or hint of green. 128 Gray Green - very much a green tint. Comes very close to Tamiya XF-14. 56 IJN Gray Green (Nakajima)- Mostly green very little gray. I've had a fair amount of correspondence with both American and Japanese researchers on the subject of A6M2 colors. I keep seeing references to "grey" when in fact A6M2s were never referred to as "grey" anything by the IJN nor Mitsubishi. I don't have the stuff right at hand at the moment, but the upshot is, A6M2s were painted in what I think is best described as a "pistachio green" color. Apparently the old chestnut that they were light grey comes from the fact that this paint, when exposed to strong UV light and salty air for an extended period tends to get chalky (and thus appear grey). But the actual color, as widely noted on J-aircraft and many other places, is most decidedly a green shade. To my eye it looks a lot like RLM 02, but slightly greener. The attached image has been shown to several people who have done research on this color, and they're in agreement that it's pretty close (as close as one can get with RGB colors on a computer monitor). Tamiya makes a spray can of this color that came out at the same time as their 1/32 A6M2 kit. That profile looks straight Gray on my monitor. So the Tamiya spray color is accurate? If thats the case, I can buy a can (AS-29) and decant it. That would certainly be the easiest option. On a similar note, I found a great walkaround of a A6M2 during my searches, but seem to have lost the link. Any ideas? 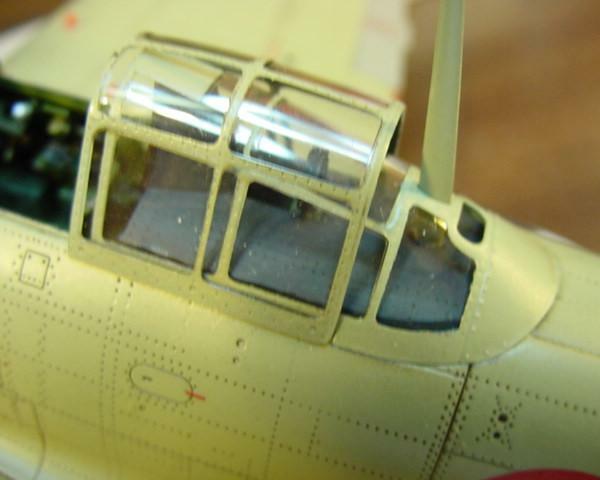 ...but the upshot is, A6M2s were painted in what I think is best described as a "pistachio green" color. Apparently the old chestnut that they were light grey comes from the fact that this paint, when exposed to strong UV light and salty air for an extended period tends to get chalky (and thus appear grey). But the actual color, as widely noted on J-aircraft and many other places, is most decidedly a green shade. To my eye it looks a lot like RLM 02, but slightly greener. The attached image has been shown to several people who have done research on this color, and they're in agreement that it's pretty close (as close as one can get with RGB colors on a computer monitor). Tamiya makes a spray can of this color that came out at the same time as their 1/32 A6M2 kit. The formula above will yield enough paint to spray the cloth covered control surfaces the correct color. The cowl on Mitsubishi aircraft will be a blue-black color, not X-18 as called out in the instructions. 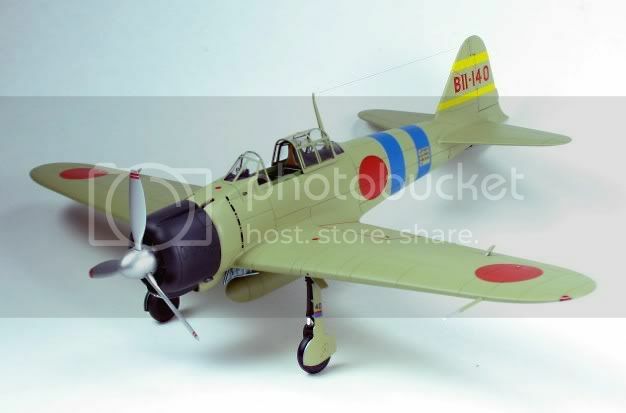 CAVEAT: These colors are only for a Mitsubishi built aircraft and are not valid for a Nakajima built A6M2 Model 21. I'll go with these. Is the Mr. Color cowling color the right shade of blue-black? Can you confirm if the rear faces of the prop blades are brown and not black as Tamiya suggests? Are there any other color mistakes in the Tamiya directions I need to look out for? Now, if you'll excuse me, I've got some mixing to do. And I do sincerely thank you for allowing me to pick your brain, and for sharing your knowledge. There is loads more that you can do to the kit to make it more accurate but that will take you outside the realm of OOB. FWIW, the cockpit should be a shade of green very close to FS 34102 and your wheel wells and gear doors (both sides) will be the same color as the underside of the aircraft. Again, this is only for Mitsubishi built aircraft. I'll have to do some research on the color of the propeller, I painted mine black. You may be right that the color should be brown..... Stay tuned. Also, Pearl Harbor zeros were relatively new and would still have a glossy, unfaded finish. However, in 1/32 scale, a gloss finish looks like a waxed dance floor. Use a semi-gloss final coat and that will take care of the finish. Here's another Zeke finished with Greg Springer's mixes( enamel). This is the Hasegawa kit in 1/48 scale. jaircraft.com is a great source for all information on colors, markings, and history. I wondered why my ears were burning! Seriously, thanks for the kind words from Tim Valdez and everyone. I have a sheet of mixes for several other types of aircraft in both Model Master enamels and Tamiya colors. I can easily cut and paste them here if you like. One key to the color of early Mitsubishi-built Zero metal-covered surfaces is the fact that the paint contained a green form of Prussian Blue pigment, as determined by infrared laser scanning. Early Nakajima Zeros had a yellowish-tan color. Both had medium gray cloth surfaces. Yes the coatings have browned somewhat in the last 70 years. I mixed the colors to match the appearance of the artifacts today. You can chose to put lesser levels of brown or khaki in the mixes because it's YOUR model.